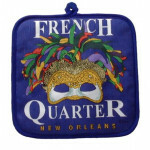 Pot holder with a New Orleans feather mask imprint. 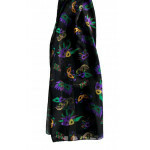 ..
13.5" X 59" silky black Mardi Gras themed scarf. 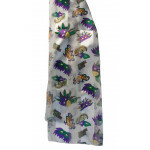 ..
13.5" X 59" silky purple Mardi Gras themed scarf. 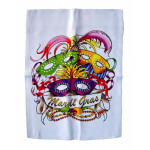 ..
36" x 20" Mardi Gras lady wearing a mask giant plaque. 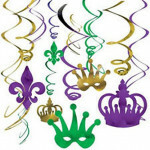 ..
28" Mardi Gras cateye decorative mask plaque. ..
28"X40" MG MASKS FLAG .. 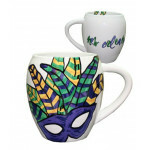 This is a jumbo size Jester mask that is sure to draw attention at your next Mardi Gras party. 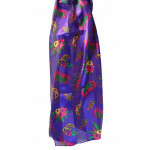 It..
Venetian jester face mask that measures 24 inches in height and 7.25 inches wide. Comes in the pu..